Objective: Rheumatoid arthritis is a dreaded disease, characterized by pain, inflammation and stiffness of joints, leading to severe immobility problems. The disease shows circadian variation and usually gets aggravated in early morning hours. Aceclofenac, a BCS Class II compound is routinely used in the treatment of pain and inflammation associated with rheumatoid arthritis. The objective of this study was to develop an osmotic delivery system of Aceclofenac that after administration at bedtime would deliver the drug in the morning hours. Methods: A series of osmotically controlled systems of aceclofenac was developed by using lactose, sodium chloride and hydroxypropyl methylcellulose K100M as osmogens. Cellulose acetate (2% w/v in acetone) with varying concentrations of polyethylene glycol-400 was used as the coating polymer to create semi permeable membrane and dissolution was carried out in 290 mOsm phosphate buffer. Formulation optimization was done from four considerations: cumulative release at the end of 6 hours (lag time), cumulative release at the end of 7 hours (burst time), steady state release rate and completeness of drug release. Results: A formulation having swelling polymer hydroxypropyl methylcellulose in the core and lactose and sodium chloride as osmogens, polyethylene glycol-400 (16.39 %) as pore former, with a coating weight of 5% was a close fit to the target release profile and was chosen as the optimum formulation. 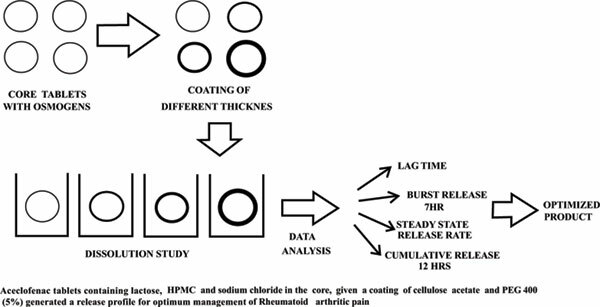 Conclusion: Aceclofenac tablets containing lactose, HPMC and sodium chloride in the core, given a coating of cellulose acetate and PEG-400 (5% wt gain), generated a release profile for optimum management of rheumatoid arthritic pain. Aceclofenac, osmotic delivery, formulation, cellulose acetate, pore former, polyethylene glycol-400.